Slam Dunk Festival Has Announced Even More Bands! 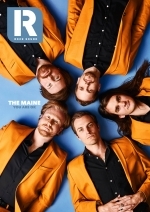 The New Cover Of Rock Sound Magazine Has Been Unveiled! Warning: This version of 'My Friends & I' may cause you to immediately start HUGGING ALL YOUR MATES. Front Porch Step has cancelled all upcoming touring commitments due to the sexual harassment allegations surrounding him, BUT Allison and Rob are still hitting the road regardless. This Is Your Last #NotTheNews Round-Up Of The Year. Savour It. There's been some actual news this week. The Movielife reformed, Fightstar returned from hiatus, and then there was Emoji Artworks. But sadly, today is our last #notthenews round-up of 2014. Try to hold back those tears while we recap all of this week's nonsense. On Monday, October 06, we popped into Camden's Underworld for the low-key event of the year. But can This Wild Life really pull off a headline performance in the capital? There might've been a handful of 'heavier' gigs kicking off across London last night, but none had a vibe quite like This Wild Life in Camden. Solid proof that you don't always need distortion to have a good time. To read our full review of the evening, head to this link. At least that's what we're calling it. It'll catch on. Probably. The Exposure section of RS192 is packed full of new bands, just waiting for your ears. This month, we say hello to Electric Century, American Fangs, Rob Lynch and more. London-based singer-songwriter Rob Lynch releases his debut album on Monday through Xtra Mile. Give it a spin with Rock Sound a week early and discover one of the captial's most honest and unique talents. Our mate Rob Lynch has had quite a year, and this week finally sees the release of his long-overdue debut album. These are our thoughts. One of the perks of working at Rock Sound is the sheer volume of new music we get to listen to every month. It really is a dream. And in every issue, the RS staff pick their Decks Of Death so you know what's actually been spinning on the office stereo. Here's what we were jamming while making the latest issue of the mag! After wowing America on Warped Tour all summer, the London singer-songwriter has been added to the UK run of fellow Warped buddies This Wild Life. This New Rob Lynch Song ‘Whiskey’ Is Lovely. Just Lovely. He's just returned from Warped Tour all hot and bothered, and the singer-songwriter has unveiled another new track.